We've arrived to it at last. The actual date when Marty McFly went to the future. 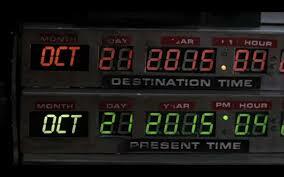 From the year 1985 to October 21st 2015, the exact date of today. Its a fun day to be a movie fan, especially ironic since the Cubs have been doing so well, and they were predicted to win the World Series this year, and that is what is happening right now. Well, I take that back, the Mets game is going so hotly in their favor right now. But boy, would that have been something. So "Back To Future" may have got the Cubs World Series win wrong, but there is some fun stuff they kind of got right. Pepsi released 8000 bottles of Pepsi Perfect in celebration of this day, and all 8000 bottles were sold this morning, good luck finding one now. Your best bet might be EBay, if you've got a surplus of cash. Its amazing to me that things like Hoverboards and Shoes that tie themselves are actual things being pushed through the business cycle now. And the things Google are doing with Facetime and Hangouts? That had to be somewhat inspired by certain scenes from the movie. I also read that USA Today had the same cover as the newspaper from the movie, showing the scene when Michael J. Fox got hauled off to jail. Overall, its been a fun day, trying to figure everything the future did bring us. Sure, we don't have flying cars and we don't have nineteen "Jaws" movies. But its cool to see the links from the movie and how they add up to today. You know what I like most about the "Back To The Future" movies? I love how optimistic they are. My dad always said that science fiction always dealt in darkness, and for the most part I agree with him. If you look at movies like "Blade Runner," "The Matrix," "Terminator," "Total Recall," "Minority Report," "A Clockwork Orange," "Gattaca," "Planet of the Apes," "Children of Men," even "Wall-E" to an extent, these are stories that are slightly dreary. In "Back to the Future," it was different. We didn't blow ourselves up, the human race did not self-destruct. It was refreshing in a very fun way. You can say the same thing about "Star Trek" which is another science fiction movie I like for similar reasons. I think "Star Wars" doesn't really count since its more of a space opera and fantasy rather than science fiction. But "Back to the Future" is cool because of its optimism. it dissected the breakthroughs our society could produce, not how we would destroy ourselves. Plus, Michael J. Fox and Christopher Lloyd make one of the most perfect teams in the history of movies. I mean they are fun to watch. They will forever be canonized as one of the greatest duos in the history of cinema. When they were together, it felt all was right, they are a couple of guys that made you feel good. They brought you on an unforgettable journey, and they did it in the best possible fashion. Re-watching the trilogy on bluray, I can't believe how well the films have held up. The format changes from disc to bluray is gorgeous, and I do mean gorgeous. It feels like a group of movies that came out a few years ago, not over twenty. Plus, the adventure, the storyline, the confidence of the characters...it all felt dazzling. It had been a few years since I had seen them, and it felt like a completely different experience for me this time around. I was reminded why I love movies in the first place. I tapped into creatively, discovery and life. This is a trilogy that surely will go down as timeless. This is a set of films I can't wait to share with my future family and several more generations to come. I hope you got out and did something fun today. I hope you watched these movies this week. I hope you plan to watch these movies this week. I hope you will show them to someone who hasn't seen them. I hope you rediscover what made them so wonderful in the first place. I hope you are rooting for the Cubbies, because they surely need some support right now. I hope you got your hands on a Pepsi Perfect and I hope it is as sweet and delicious as it is in my dreams. If you don't plan to drink, I certainly don't blame you, hold onto that for as long as you can. Heck, maybe watch "Jaws" today too, tis the season to get some suspense in with it being Halloween and all. I hope these movies are grinding the gears in the heads of the next generation, and perhaps by the time I am an old man, we will have flying cars. "Back To The Future" is a reminder that anything is possible. It is a reminder that dreams can not only come true, but should be allowed to flourish. It reminds us that courage should be an important dietary supplement that keeps our lives running, keeps us happy, keeps us adventurous, keeps us human. It reminds that even though there is lots of darkness in the world, there is so much to be happy for, so much to be proud of, so much to desperately hold onto. That is a positively encouraging thought. Have fun today, and if you haven't seen these movies yet. Now is as great a time as any.